Dannii Minogue has graced the covers of international magazines such as Harper’s Bazaar, InStyle and Marie Claire. She’s a fashion and entertainment icon and well known for her hard work, professionalism and global success, particularly in the television, fashion, literary and music fields. Dannii has been an entertainer since the age of seven, performing professionally ever since. It is due to her outstanding international career and major contribution to the entertainment industry that Dannii was awarded the honorary degree – Doctorate of Media from Southampton Solent University for her services to the entertainment industry over the last 40 years – at a special ceremony on board the HQS Wellington. Always at the forefront in the world of social media, and authentically engaging with her fans, she has become a leading influencer, sharing this with her 1.14 million Twitter followers, over 440,000 Facebook fans and more than 295,000 current followers on Instagram. Dannii can be currently seen co-hosting the Australian version of Netflix’s major reality competition series, ‘Ultimate Beastmaster’, alongside former rugby player Nick ‘Honey Badger’ Cummins. The series launched globally on Netflix in August 2018 and is the first competition show greenlit by Netflix where hosts from each of the participating countries commentate alongside one another so that each territory sees a localized version of the show. The series follows competitors along a difficult obstacle course; the winners from each episode compete in a grand final each season. Dannii describes the show as a sporty version of The Eurovision Song Contest, which, of course, she can relate to. Netflix announced Dannii’s involvement in ‘Ultimate Beastmaster’, in true Minogue style, as part of the Netflix Mardi Gras Float in the 2018 Mardi Gras Parade, alongside Hollywood stars from ‘Orange is the New Black’, ‘13 Reasons Why’ and ‘Mindhunter’. This year, Dannii hosted Network Seven’s brand new series, ‘Dance Boss’. The new format saw teams of workers from the same workplace or profession dance-off to win a cash prize of $100,000. Dance has been a constant force in Dannii’s life from her Young Talent Time days to her chart topping music career. Strutting her stuff is in Dannii’s DNA! Dannii is also executive producer on Dance Boss, this exciting new role is a culmination of her many years experience – in front of and behind the camera – since her childhood. Dannii is also currently working on the development of a drama series that she will co-produce and executive produce. Dannii’s experience in the television industry is second to none, and this project will allow her to further extend her experience behind the camera. Dannii’s television judging and hosting roles on Australian and UK television have taken up much of her career space for the last decade, and audiences wholeheartedly embrace her. She has starred in international formats including ‘The X Factor UK’, ‘Australia’s Got Talent’, ‘Britain and Ireland’s Next Top Model’ and ‘The X Factor Australia’. Dannii first stepped into the television judge’s chair in 2007, launching Australia’s Got Talent. She completed six series (2007-2012) of AGT and held the title as the only original judge while the show was on Seven Network. Dannii’s long-standing relationship with the Seven Network continued when she was offered the role of judge on The X Factor Australia where she completed three seasons (2013-2015). This was Dannii’s seventh series as a judge on The X Factor, having also been a judge for four years in the UK (2007-2010). The same year as her debut on Australia’s Got Talent, her popularity and natural ability in the judge’s seat saw Dannii take on the role of judge and mentor on The X Factor UK, Britain’s highest rating television show. During these years, Dannii worked in both territories across the world in these major format shows. After completing four consecutive series with ITV in the UK, alongside Simon Cowell, Louis Walsh and Cheryl Cole, Dannii decided 2010 was to be her final series. Finishing on a Minogue-style high, her act won the one million pound recording contract over One Direction and Rebecca Ferguson, becoming ‘Team Minogue’s’ second victory. Dannii’s final series of The X Factor UK remains one of the most successful with an incredible audience peak of 19.4 million viewers, and the finale being the most viewed television episode of 2010. In 2013, Dannii joined the on-screen team on Britain & Ireland’s Next Top Model for Sky Living in the UK. She was thrilled to work with Elle Macpherson and Tyson Beckford for Season 9 of the worldwide phenomenon and again demonstrated her skill and passion at mentoring in a whole new genre. Sky Living hailed this as the biggest shake-up of the UK show ever, and ratings were the highest the series had ever achieved. Dannii returned to prime-time UK television last year on BBC’s new Saturday night talent show, ‘Let It Shine’. Created by Gary Barlow and hosted by Graham Norton and Mel Giedroyc, Dannii took a judging seat alongside regulars Gary and Martin Kemp of Spandau Ballet and Eastenders fame, together with a variety of guest judges including Amber Riley from hit US TV series Glee, legendary UK singer Lulu and ‘Hairspray’ star and talk show host, Ricki Lake. The panel searched for and ultimately chose the five band members for the new stage production called ‘The Band’, based on the music of Take That. ‘The Band’ kicked off their sellout UK tour of ‘The Band’ in September 2017 in Manchester. With her background in live family entertainment TV, some of Dannii’s favourite career moments are hosting ITV1’s prime-time special Ultimate Movie Toons (2010), hosting UK television prime time special for ITV1 ‘Boyzone at 20: No Matter What’ (2013), presenting The Lion King special for Disney (1995) and hosting the UK Nickelodeon Kids Choice Awards (2008). So impressed was the President of Nickelodeon U.S, Cyma Zarghami, that she requested Dannii lecture with her at a members only event at the British Academy of Film & Television Arts (BAFTA). Very few experience the success and longevity in the entertainment industry Dannii Minogue has enjoyed. She first rose to prominence in the early ‘80s in two iconic Australian television drama series; Skyways and The Sullivan’s. She later became a house-hold-name for her six-year role in the weekly Saturday night prime-time variety show Young Talent Time, the Australian equivalent of Disney’s Mickey Mouse Club. This was Dannii’s first foray into fashion world, when she signed a deal to design her own fashion range for Kmart at the age of 16, as it turned out designing came natural to Dannii and the first range sold out in a record breaking 10 days. Dannii continued to star in Australian network dramas before joining the internationally successful soap opera Home and Away, where she played the rebellious Emma Jackson throughout 1989 and 1990. During this time, Dannii also starred in the feature film Secrets opposite Shine’s Noah Taylor. Dannii’s theatre and musical roles include her all-time favourite movie character ‘Rizzo’ in Australia’s production of Grease – The Arena Spectacular. Playing to more than 450,000, it was the largest production of ‘Grease’ ever held in the world. Next came the role of Lady Macbeth in a special outdoors adaptation of Macbeth for the Edinburgh Festival. Another triumph saw Dannii play leading role ‘Esmeralda’ for five sell-out months in Notre Dame De Paris in the West End at London’s prestigious Dominion Theatre. It was here that Dannii picked up the award for ‘Best Stage Performance,’ playing to a 2,000 strong audience, seven times a week. In 2009, following Dannii’s appearance on ITV1’s Piers’ Morgan Life Stories where she sat openly discussing for the first time her most personal feelings and life story, came her autobiography ‘Dannii Minogue My Story’, published by Simon & Schuster. Personal, contemplative and passionate, it marked a brave and exciting phase for both artist and audience, with sales exceeding 300,000 copies in the UK alone. In September 2011, following her best-selling autobiography, Dannii expanded her writing portfolio with a second published book ‘My Style’, a 250-page fashion bible. 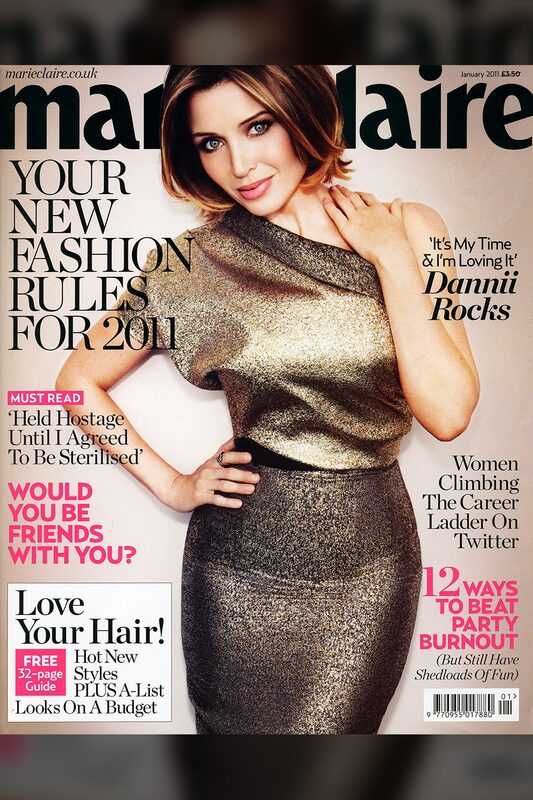 As well as being contracted as contributing editor for AOL’s my daily.co.uk during its inaugural year in 2011, Dannii also enjoyed her contributing editor status at UK’s biggest-selling glossy monthly Glamour during 2011 and 2012, where she was the first female to grace the cover twice in the same year. Dannii announced her exciting venture as a designer for Target in 2014, introducing their first ever line of petite clothing. The ‘Dannii Minogue Petites’ collection was launched at the Virgin Australia Melbourne Fashion Festival (VAMFF) in March that year to an overwhelmingly positive reception and has continued to grow and achieve record-breaking sales since. Her role as a designer for Target continues to grow. The Petites collection is designed for ‘petite’ women ranging from sizes 4P-16P who struggle to find clothing tailored to their shape and size. The incredible response has led to major growth with Dannii Minogue Petites now available in more than 150 Target stores and online throughout Australia. Being selected as one of Vogue’s Top 3 most stylish women in the world in 2011 cemented Dannii’s reputation and expertise as a worldwide fashion icon. 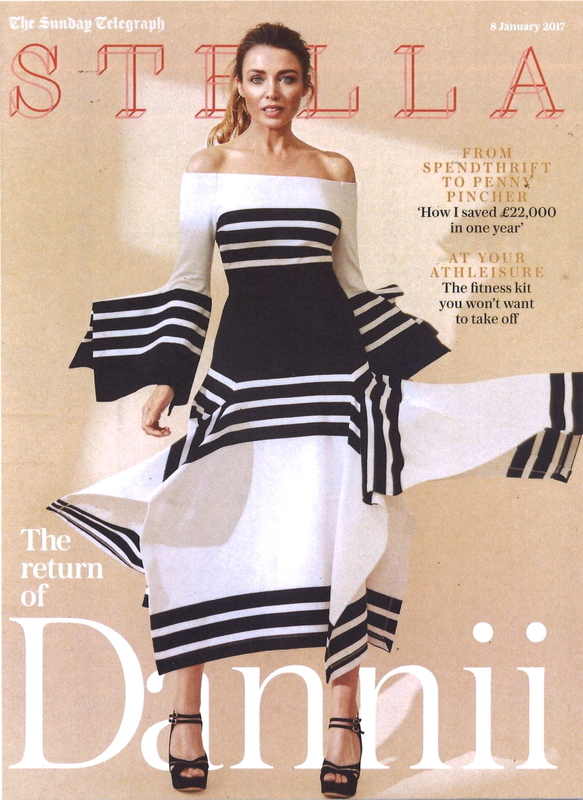 Dannii’s fashion label Project D London (2010-2013), grabbed worldwide attention and was acclaimed for its high-profile fans including Kate Middleton, Pippa Middleton, Elizabeth Hurley and her sister Kylie Minogue. Dannii has dedicated much of her time these past few years to the fashion industry and was honoured to be the Ambassador for Melbourne Spring Fashion Week 2011. As one of Australia’s biggest female exports, Dannii is no stranger to the music charts. In 1990 the then pop starlet released her debut Top 10 single and album Love and Kisses. A string of Top 10 chart hits followed internationally including Jump To The Beat, This Is It, Put The Needle On It, I Begin To Wonder and You Won’t Forget About Me. Dannii proudly holds the music title Queen of the Clubs after scoring a record-breaking 14 Number One dance singles in the UK; more consecutive than any other female artist in the world. This achievement began in 1997 with the Xenomania chart-topper All I Wanna Do. The dance music hits continued with the international hit Who Do You Love Now? In 2001. Madonna then sealed Dannii’s place at the top with Don’t Wanna Lose This Groove in 2003, granting sampling permission (for the first time) with a bootleg of Into The Groove and Don’t Wanna Lose This Feeling. Dannii’s music has earned her more than 200 weeks, virtually four years, on the official UK sales chart, selling in excess of seven million records worldwide. In 2013, Warner Music Australia released This is It: The Very Best Of, a collection of singles spanning the past 23 years. It also featured a new track ‘Cos You’re Beautiful, co-written by one of Dannii’s The X Factor UK contestants, Ruth Lorenzo, and the previously unreleased duet with her sister Kylie, The Winner Takes It All. With music being such a passion for all of her career, Dannii recorded one of her favourite Disney movie songs, ‘That’s How You Know’, for Universal’s Australian artists release of the album We Love Disney – released for Christmas 2014. In 2015, on the series finale of her last X Factor in Australia, a huge buzz was created when Dannii and her sister Kylie performed together on television for the first time in 30 years, singing their Christmas disco hit ‘100 Degrees’ from the Kylie Christmas album, with the video clip taking the number one spot world-wide on the iTunes music video chart the same week. Dannii then flew over to London in December for a surprise performance of ‘100 Degrees’ at Kylie’s Christmas concert at the prestigious Royal Albert Hall. ‘100 Degrees’ reached the Number 1 spot on the UK Official Vinyl singles chart for 2016. The year 2015 marked the 25th ‘Danniiversary’ of her very first Australian single release, ‘Love & Kisses’, and Dannii’s long-awaited and much anticipated return to music which she announced at the 2015 Sydney Mardi Gras event. The performance wowed thousands of attendees who were treated to a spectacular disco-mega-mix production, brought to life by the world famous creative team at Squared Division. Further to her performance and announcement, and cementing her title as Queen of Clubs, Dannii recorded a new song as a celebratory anthem for Mardi Gras, ‘Summer of Love’. The track reached the number one spot on the UK Club Charts and was remixed internationally by As I Am, Seamus Haji and Rich B & Phil Marriot. This number one song brings her a total of 14 #1 UK Club Chart hits as well as the record for the most amount of consecutive #1’s in the UK Upfront Club Charts. To celebrate the 15th anniversary of the release of Dannii’s classic pop/club album Neon Nights, London Records re-released the ‘Neon Nights (Deluxe Edition)‘, in limited edition blue and pink vinyl, limited edition black vinyl and a limited edition deluxe CD on June 22, 2018. The vinyl and CD releases contained the Deluxe Edition album which includes 12 remixes by the likes of Jason Nevins, Almighty and Tiga. Two of those remixes are celebrated mash-ups; ‘Don’t Wanna Lose This Groove’, which mixed ‘Don’t Wanna Lose This Feeling’ with Madonna’s ‘Into The Groove’, (the first remix Madonna ever approved of one of her songs), and ‘Begin to Spin Me Round’ which mashes up Dead or Alive’s iconic ‘You Spin Me Round (Like A Record)’ with ‘I Begin To Wonder’. Dannii has since toured with her band in Australia as special guest of Culture Club and Take That. Continuing her passion for music into 2017, Dannii released further tracks ‘Holding On’ and ‘Galaxy’ written by another Australian international superstar, Sia. From cutting individual and iconic sounds for our dance-floors, Dannii sliced up British radio by creating her own music show called Neon Nights for London’s Capital Radio Group in 2003. Her radio show was the first to ever be sold by the radio network internationally. Dannii signed on as the first ever L’Oréal Professionnel Australia Ambassador last year and the success of that campaign has just seen L’Oreal Professionnel announce its continued partnership with Dannii for 2018. Her association with the Parisienne house of professional colour is a natural fit; sharing the values and qualities of the modern woman. “We are so pleased to be continuing our partnership with such an incredible beauty like Dannii Minogue” comments Olga Zanetti, General Manager of L’Oréal Professionnel Australia. Dannii’s announcement as Ambassador for L’Oreal Professionnel created much social media and traditional press hype, she appeared in various print and online articles, as well as the covers of Marie Claire, Stellar Magazine Australia and The Journal. Dannii’s Ambassadorial role for Virgin Australia began in 2011 shortly after Dannii returned to live in Australia. It was a match made in heaven for a very busy traveller with her favourite airline. Since then, Dannii has been involved in exciting initiatives with Virgin Australia ranging from the Frequent Flyer program launch, Virgin Australia Hat Valet Service for Spring Racing Carnival and the inaugural direct flight from Melbourne to Los Angeles. Having been embraced by the UK, Dannii was thrilled to have been a part of the British institution Marks and Spencer prestigious nationwide advertising campaigns during 2010, 2011 and 2012; alongside one of her fashion idols, Twiggy. Her role as a global Ambassador for one of the world’s leading airlines, Etihad Airways™ for nine years, saw Dannii launch the Melbourne route in 2008, attend and host various world conferences and awards nights, including hosting the Los Angeles route launch, with Harry Connick Jnr performing, held at the opulent Beverly House Estate. Outside the world of showbiz, Dannii supports various organisations including The Nappy Collective, St Kilda Mums, the Olivia Newton-John Cancer and Wellness Centre and CVQO.